I’ve read in several different places that a Greek exit from the European Monetary union is not a big deal because Greece’s economy is small and represents only a small fraction of the economic output of the eurozone. Besides, it is already discounted in the markets. I disagree.Remember in the ’90s, when the Thai baht crashed, people said that Thailand was such a small part of Asia that there would be no fallout. But the fallout was huge because every country in the region had the same issues. This is clearly the case in the EMU. In reality, the issues in Portugal, Spain and Italy are the same as those in Greece. While I believe that there could come a time when Greece could exit gracefully, that time is not now because there is no process or set of rules governing such an exit. Besides, if a sovereign country wants to exit, what, short of war, could prevent it? If Greece decided to exit now, it would repudiate its external debts and, as a result, banks and important European institutions could face insolvency. Greek society could deteriorate into chaos, including rioting, civil unrest and economic dislocation of many Greek citizens. Such contagion could well spread to Spain, Portugal, and even Italy. • Bank runs, considered silent until now, would erupt in the other suspect countries (Portugal, Spain and Italy). If Greece leaves the EMU under these conditions, what is to prevent Portugal and/or Ireland from doing the same? A Greek chaotic exit would make the capital markets skeptical as to whether the aforementioned countries plus Spain, and even Italy, could remain in the EMU. And the capital markets will test their resolve by raising rates in these countries to unacceptable levels until action is taken. Portugal, Spain and Italy are repeats of Greece on a much larger scale. While aid from the other EMU countries for Spain’s insolvent banking system appears to have been forthcoming, at this writing, the terms of such aid have not been clearly established. Furthermore, the Spanish citizens are up in arms (literally) that the banks are being saved with nothing for the common citizen. And, if Spain’s banking Portugal’s, Italy’s or Ireland’s? Unfortunately, after Spain, the funding source, the EFSF, is essentially out of cash. The Greeks go to the polls today and may elect leaders who will repudiate the austerity deals that the former government made in return for bailout funds. Or, as happened in the May elections, no one party may end up having enough influence to form a government. Furthermore, the Greek government is set to run out of money by June’s end. Let’s hope that Syriza’s party leader, Alexis Tspiris, if he heads the government, is just posturing about debt repudiation to get a better deal from the other EMU countries. There are grave implications for the capital markets. The chaos and contagion in Europe could well spread to the U.S. financial system because, as we recently saw at J.P. Morgan, no one, including Jamie Dimon, knows what is on the balance sheets of the large U.S. banks. Any crack in the financial system foundation could well cause chaos even in the U.S. In addition, financial chaos always causes large equity market downdrafts. Today’s elections in Greece are key, and the results of those elections will determine if Greece will even cooperate. If it doesn’t, sometime in late June or early July, it will run out of money. Given the track record of the European politicians, the probability appears low that Europe can avoid the chaotic Greek exit. Greece isa big deal, and I believe that we will find out just how big very soon. Robert Barone and Joshua Barone are Principals and Investment Advisor Representatives of Universal Value Advisors, LLC, Reno, NV, an SEC Registered Investment Advisor. Statistics and other information have been compiled from various sources. Universal Value Advisors believes the facts and information to be accurate and credible but makes no guarantee to the complete accuracy of this information. Exchange Commission of the United States. A more detailed description of the company, its management and practices are contained in its “Firm Brochure”, (Form ADV, Part 2A). A copy of this Brochure may be received by contacting the company at: 9222 Prototype Drive, Reno, NV 89521, Phone (775) 284-7778. Robert Barone (Ph.D., Economics, Georgetown University) is a Principal of Universal Value Advisors (UVA), Reno, NV, an SEC Registered Investment Advisor. Dr. Barone is a former Director of the Federal Home Loan Bank of San Francisco, and is currently a Director of Allied Mineral Products, Columbus, Ohio, AAA Northern California, Nevada, Utah Auto Club, and the associated AAA Insurance Company where he chairs the Investment Committee. From early last October to the end of last month, the S&P 500 rose 25%; amazing for an economy that is struggling to stay out of recession. Then again, the equity markets are hooked on the liquidity drug. When Federal Reserve Chairman Ben Bernanke, in his recent semi-annual testimony before Congress, did not hint that QE3 was just around the corner, the market sold off. When the European Central Bank broke its traditional role as lender of last resort and morphed into a gift giver to its member banks (to the tune of more than a trillion dollars), much like our Fed, the equity markets soared. Money printing can’t go on forever, can it? There is no doubt that American manufacturing is undergoing a renaissance. Labor costs in Asia are on a steep rise while wages here have been stagnant for several years. Shipping costs, quality control and culture are other factors. But, manufacturing represents less than 12% of GDP. It, alone, cannot drive significant economic growth. Gasoline prices are up more than $.60/gallon year to date with talk of $4.50 gas by summer. That cost/gallon is already here in some markets. Every penny increase drains $1.5 billion annually from other consumer discretionary spending. That’s about $90 billion so far for 2012. And what happens to gas prices if the Middle East flares up again? While the first quarter is far from over, early data suggest a much softer than expected GDP. Retail sales have been soft except for automobiles (pent-up demand or just a rush to buy fuel efficient vehicles ?). Consumers (70% of GDP) have shown no real income growth for many quarters, and incomes are tumbling in Europe. Inventories appear to be on the high side given the level of demand. So additional production won’t be forthcoming. Despite a reinstitution of 100% depreciation for capital equipment, much of that demand was pulled into 2011, as the business community was uncertain as to whether or not the tax break was going to be reinstated in 2012. The state and local government sector is still in contraction, and, given the slowdown evident in the rest of the world, exports aren’t likely to add to GDP. Of course, the market may like the softer side of GDP, as it likely ensures another dose of the liquidity drug from the money czar, Bernanke, the king of money printing. Europe is sicker than the markets have priced in. The hoopla around the Greek bailout is just another can kicking. Because the Greek populace hasn’t accepted the idea that they have lived beyond their means for the past decade, austerity won’t be successful. Politicians who promise to end the austerity are likely to be elected. Eventually, Greece will need to have their own currency which can fluctuate in value vis a vis other currencies with commensurate interest rate levels. It is rare that all of Europe is in recession at the same time. The current market expectation is that Europe’s recession will be mild. But, don’t forget, Germany’s biggest export clients are other European countries. In fact, as a general rule, all of Europe’s economies export heavily to each other. Being in recession together is going to have a large impact on those exports. In addition, if the Euro remains at its current lofty level (above $1.30), it will be more difficult to export to non-EU countries. The determination by the ISDA (International Swaps and Derivatives Association) that Greece officially defaulted on its debt when it invoked its recent legislatively passed “Collective Action Clause” to force investors to take losses is actually good news for the other so-called troubled European sovereigns (Portugal, Spain, Italy, Ireland) because it assures private sector investors that if they buy the so-called troubled foreign sovereign bonds, hedge them with Credit Default Swaps (CDS) and a Greek style default occurs, they will be paid at or near par value. If the CDS payout had not been triggered, the private sector investors would view the purchase of such sovereign debt as having significantly more risk, and that would result in a much higher interest cost of that sovereign debt to the issuing countries. In addition, it would throw the whole CDS concept into confusion, potentially impacting even the higher quality sovereigns like, Germany, the U.K., Canada, Australia, and even the U.S. This is not to say that the world is now safe from financial contagion, as, in the context of world markets, Greece’s default is an expected and well prepared for event. The real worry should be if Spain (debt > $1 trillion) and/or Italy (debt> $2 trillion) default. In addition, the CDS market is not transparent, and no one knows where the CDS obligations lie. While a Portuguese and/or Irish default would have about the same individual impact as that of Greece (economies slightly smaller and not as indebted), we should worry that a rolling set of smaller defaults would eventually cause a major CDS insurer to fail due to the cumulative impact of the several defaults. After all, it is likely that the CDS insurers who dabbled in Greek CDS, are also involved in CDS insurance of the other high debt European countries. And, if a significant CDS insurer defaults (e.g., an institution similar in size and stature to AIG in 2009), we could, indeed, have contagion. But even ignoring Greece for the short term, the ECB’s LTRO 1 and 2 appear to make Europe’s banks even more vulnerable. Unlike the Fed, which purchased questionable assets from bank balance sheets and put them on its own, the ECB has not followed suit. In fact, it stepped in and, by force majeure, inserted itself as senior to other bondholders holding the exact same Greek bonds, thus avoiding any losses in its own portfolio. That makes losses for the private sector even greater. Worse, it sours potential investors in European sovereign debt, seeing that they cannot easily quantify their risks as they can’t know how much of the same sovereign debt they own may be owned by the ECB. This partially reverses the positive impact that the triggering of the CDS default will have on the European sovereign debt market. Finally, the LTROs may make European banks even more insolvent than they are now, as they have been encouraged to take the cheap ECB funding and purchase European sovereigns for the interest spread (by Basle II and III rules, the debt of the European sovereigns is “riskless” and requires no capital backing on a bank’s balance sheet)! 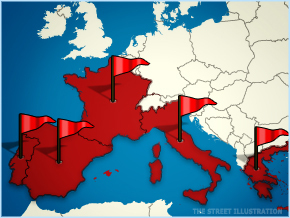 Further sovereign debt crises, e.g., Portugal, Spain, or Italy, will eat away at already scarce European bank capital. Contagion could very well result. Looking at the GDP of Europe relative to China, if one includes all of the European Union countries and those closely related, Europe’s economy is about twice the size of China. If China’s GDP growth went from 9% to 3%, the equity markets would certainly have a huge sell off. But, it is likely that Europe’s GDP will fall from about 1.5% in 2011 to -1.5% in 2012, maybe even more than that. Do the math! This is equivalent to a Chinese hard landing. As the European recession unfolds, the equity markets are likely to wake up. Speaking of China, a slowdown is clearly developing. They actually ran a trade deficit for the first two months of 2012 signaling a real slowdown in exports. Retail sales have been softer than expected and the real estate bubble there appears to be in the process of popping as property sales and prices are plunging. No wonder the government recently lowered its official growth forecast from 8% to 7.5%. This is not to say that China, itself, is entering a recession, but a slower growth rate there (2nd largest economy) in combination with growth issues in the US (largest economy), Japan (3rd largest), and a significant recession in Europe bodes ill for worldwide growth and will eventually play out in the equity markets. The profit implications for multinational corporations of the severe recession in Europe, and a slowdown in China and elsewhere are significant. Analysts have continued to forecast rapid earnings growth and high profit margins even in the face of rising energy and food costs and stagnant U.S. and falling European incomes. Using such rosy profit forecasts makes the market look undervalued. However, a 15% – 20% profit decline is normal for a recessionary world. If you plug that in, the equity markets look overvalued today. Wasn’t it somewhere around this time last year that the equity markets were also priced for perfection? Didn’t we hear that the economy had achieved “escape” velocity and that the recovery was about to accelerate? And, didn’t the market sink when the economy fizzled and needed the QE2 liquidity drug injection? In fact, the S&P 500 ended 2011 at exactly the point where it began, with a lot of volatility in between. So far, 2012 appears to be following 2011′s path. Robert Barone (Ph.D., Economics, GeorgetownUniversity) is a Principal of Universal Value Advisors (UVA),Reno,NV, an SEC Registered Investment Advisor. Dr. Barone is a former Director of the Federal Home Loan Bank of San Francisco, and is currently a Director of Allied Mineral Products, Columbus, Ohio, AAA Northern California, Nevada, Utah Auto Club, and the associated AAA Insurance Company where he chairs the Investment Committee. Information cited has been compiled from various sources which UVA believes to be accurate and credible but makes no guarantee as to its accuracy. A more detailed description of the company, its management and practices is contained in its “Firm Brochure” (Form ADV, Part 2A) which may be obtained by contacting UVA at:9222 Prototype Dr.,Reno,NV 89521. Ph: (775) 284-7778. NEW YORK (TheStreet) — The determination by the International Swaps and Derivatives Association that Greece officially defaulted on its debt when it invoked its recent legislatively passed “Collective Action Clause” to force investors to take losses is actually good news for the other so-called troubled European sovereigns like Portugal, Spain, Italy and Ireland. The ISDA determination assures private sector investors that if they buy the so-called troubled foreign sovereign bonds, hedge them with credit default swaps and a Greek style default occurs, they will be paid at or near par value. If the CDS payout had not been triggered, the private sector investors would view the purchase of such sovereign debt as having significantly more risk, and that would result in a much higher interest cost of that sovereign debt to the issuing countries. In addition, it would throw the whole CDS concept into confusion, potentially impacting even the higher quality sovereigns like, Germany, the U.K., Canada, Australia, and even the U.S. According to the ISDA, about $3.16 billion of Greek debt is covered by the CDS (4,323 swap contracts). On March 19, an auction will be held which will set the “recovery” value on the Greek bonds. The difference between that recovery value and par will be the payout of the CDS. For example, if the auction results in a recovery value of 20%, then the CDS payment will be 80%, or about $2.5 billion. This is not a large amount in the context of world markets, and it would be a surprise if any viable CDS issuer will be greatly impacted, although it does appear that Austria’s KA Finanz, the “bad” bank that was created in 2008 when Kommunalkredit Austria AG was nationalized and given all of the “distressed” assets, will be stuck with CDS losses in excess of $550 billion which will require the Austrian government to step up with a significant capital injection. The “non-eventness” of the CDS payouts is a result of the fact that there has been a long lead time for the issuers to adjust their risk portfolios to deal with the likelihood of a Greek default. Over the past year, the amount of Greek debt covered by the CDS has halved. Compare this to the Lehman default of $5.2 billion where there was almost no lead time between the emergence of the Lehman issue and its bankruptcy filing. It was the lack of such a lead time that caught CDS issuers, like American International Group(AIG), with no time to adjust their risk portfolios, and required government intervention to prevent a domino default effect. With Greece, no such domino effect is expected although there is always the possibility (albeit low) of a surprise. We will know that soon after the March 19 auction when settlement must occur. This is not to say that the world is now safe from financial contagion, as, in the context of world markets, Greece’s default is an expected and well prepared for event. The real worry should be if Spain, with a debt of about $1 trillion and/or Italy with a debt of about $2 trillion default. In addition, the CDS market is not transparent, and no one knows where the CDS obligations lie. While a Portuguese and/or Irish default would have about the same individual impact as that of Greece (economies slightly smaller and not as indebted), we should worry that a rolling set of smaller defaults would eventually cause a major CDS insurer to fail due to the cumulative impact of the several defaults. After all, it is likely that the CDS insurers who dabbled in Greek CDS, are also involved in CDS insurance of the other high debt European countries. And, if a significant CDS insurer defaults (e.g., an institution similar in size and stature to AIG in 2009), we could, indeed, have contagion. The rules of the game are such that the managements of large Wall Street entities are allowed to gamble with assets entrusted to them by an unsuspecting public. If the bets are successful, the spoils flow entirely to the management and the firm, with nothing going to the clients whose assets are at risk. On the other hand, if the bets fail, the clients take the entire loss! Unfair? Of course. But, as you will see if you keep reading, MF Global’s client assets will not be “found,” and, worse, unless the NY attorney general becomes incredibly creative, no one is likely to go to jail because no laws appear to have been broken. MF Global is just another piece of evidence that the current financial system is addicted to and permits excessive leverage and is deeply flawed. Until this is recognized and fixed, the financial system will continue to be besieged with crises spawned by Wall Street greed. There are likely other, yet to be discovered, atrocities lurking in the shadows. It appears that MF Global, as well as every other major US investment banking firm, has taken “advantage of an asymmetry in brokerage borrowing rules that allow firms to legally use client money to buy assets in their own name,” Christopher Elias notes in a recent Thomson Reuters article. Simply put, MF Global borrowed money, and, using that borrowed money, purchased the debt of the European periphery (Italy, Ireland, Greece, Spain, and Portugal) at very attractive yields. The borrowings and the debt purchased had the same maturity date, so the proceeds of the debt maturities were to pay back the borrowings. MF collected the difference between the low rate it paid on the borrowings and the high rate it received on the debt. The euro debt it purchased was guaranteed by the European Financial Stability Facility (EFSF). To get the low rate, MF had to pledge collateral. So, it pledged the euro debt, and as additional collateral, it borrowed and pledged its clients’ assets, which assets it held as custodian. Looks like a no-brainer! So thought Jon Corzine and Co. In the US, a client with an account at a broker-dealer can place his assets in a “margin” account. The client is then allowed to borrow against those margined assets. There are rules for this called “margin requirements.” Generally, speaking, the value of the assets assigned to “margin” must be greater than the amount borrowed by a factor set by the Federal Reserve under Regulation T.
If the market value of the assets assigned to “margin” falls in value to the point where the margin requirement ratio is violated, a “margin call” is generated. The client either has to assign or pledge more assets to “margin,” or reduce the borrowing via a cash deposit. If the client fails to do either of those in the time allotted by regulation, usually three business days, the assets that were pledged to “margin” are liquidated (sold out) and the proceeds are used to offset the borrowings until the required margin ratio is satisfied. Of relevance, clients who assign their equities to “margin” (the only other alternative is called “cash”) so that they can borrow against them also automatically grant their broker-dealer the right to “lend” their assets to another investor who wants to “short-sell” that particular asset because a short-seller must first “borrow” existing stock in order to “sell” it. The broker-dealer makes money by lending out equities in margin accounts to short-sellers. The everyday American investor is unaware of this, and earns nothing. So, how did MF Global lose client assets? In the US, broker-dealers can use margined assets as a funding mechanism, i.e., by borrowing those assets themselves and using them as collateral to borrow. But in the UK, those same borrowed assets can be pledged several times over (called rehypothecation), resulting in very significant leverage. That is, the client assets stand behind several borrowings rather than just one. Buried somewhere deep in the legalese of the account forms (you know the pages and pages of legal gobbledegook that nobody reads because one has to be an attorney to understand it), the clients gave MF Global the right to transfer those client assets to its UK subsidiary and to “borrow, pledge, repledge, hypothecate, and rehypothecate” those assets. According to the Thomson Reuters article cited above, such language is common in most large US broker-dealer agreements. That language allows the large broker-dealers to circumvent US law and take advantage of UK law where rehypothecation (leverage) is allowed. For MF Global, the unanticipated “tail” event occurred. (“Tail” events are only supposed to occur very infrequently. However, in an unstable financial system, they occur often.) When the value of the European periphery debt declined this past fall (even that guaranteed by the EFSF), margin calls occurred. MF Global would have been okay if it hadn’t used so much leverage. No laws appear to have been broken. No one is likely to go to jail. But, as you can see, the financial system is deeply flawed and is rigged in favor of Wall Street and against the ordinary investor. The causes of the financial crisis that appeared in the US in 2009 have not been resolved, only papered over (with money printing). In order to have a “fair” and healthy financial system, the excessive use of leverage, such that success leads to untold wealth for the managers and failure is directly borne by unsuspecting clients or taxpayers, must be changed. Until this occurs, we will continue to experience such debacles. And the volatility caused by them will continue to keep the financial system unstable and limit economic growth. Robert Barone and Joshua Barone are Principals and Investment Advisor Representatives of Universal Value Advisors, LLC, Reno, NV, an SEC Registered Investment Advisor. Statistics and other information have been compiled from various sources. Universal Value Advisors believes the facts and information to be accurate and credible but makes no guarantee to the complete accuracy of this information. Universal Value Advisors, LLC is a registered investment adviser with the Securities and Exchange Commission of the United States. A more detailed description of the company, its management and practices are contained in its “Firm Brochure”, (Form ADV, Part 2A). A copy of this Brochure may be received by contacting the company at: 9222 Prototype Drive, Reno, NV 89521, Phone (775) 284-7778. NEW YORK (TheStreet) — Given the speed at which markets move, and given the volatility that accompanies the hopes and fears that occur when the key European leaders meet to try to make progress on the European debt crisis, it is somewhat risky to try to describe what will happen to the European Monetary Union (EMU) in 2012. Something that I write today, in early December, could be obsolete as early as next week. So, I will approach this with what I consider to ultimately be the most likely scenario, why it is most likely, and where the remaining dangers lie. Those that want the causes of the crisis, overspending and out of control deficits via entitlement and social welfare spending, to be addressed. While these folks appear to be the minority among the political class, their strength lies in the fact that the politicians representing the economically strongest EMU member, Germany, hold this view. As an aside, some have wondered why the euro has kept its value high vis-à-vis the U.S. dollar. It is precisely because the ECB hasn’t significantly expanded its balance sheet while the U.S. Fed has. In fact, the big worldwide market rally on Nov. 30 due to the “coordinated” central bank policy of insuring liquidity for Europe’s banks, was a “dollar” policy, i.e., dollars, not euros were made available. So far, the ECB appears to have remained faithful to its mandate as the guardian against inflation, and nothing else. The U.S. Fed tripled the size of its balance sheet with some apparent success at keeping its financial system from collapsing and, until now, those actions appear to have had no apparent large unintended consequences. There has been some moderate inflation officially reported (and disputed by some), and some believe that the Fed’s balance sheet expansion has been behind the rapid rise in commodity and food prices. But given the apparent success in staving off financial collapse with such policies, the most likely scenario is the first one outlined above, i.e., the use of the ECB or some structure around it (including the EFSF and the International Monetary Fund (IMF)) to directly purchase or partially guarantee the sovereign bonds of the peripheral countries. The “bazooka” theory appears to apply here. As long as the market knows that the ECB has a bazooka (the power and authority to print euros), and is willing to use it, it won’t have to. As U.S. Treasury Secretary, Hank Paulson found out in 2009 that the “bazooka” theory doesn’t always work. Time and again, the capital markets have demonstrated that they are much more powerful than any central bank or sovereign treasury. The most likely scenario, then, is an emerging consensus in Europe as follows: Through a series of bilateral agreements to avoid having to get 17 separate countries to approve changes to the treaties that govern the EMU, a painstakingly long process, the offending peripheral countries (Italy, Portugal, Spain, and perhaps, Ireland) may agree to some level of verifiable austerity with benchmarks and external audits. In return, Germany and its political allies will permit the ECB to expand its balance sheet either by directly purchasing the sovereign debt of the peripheral countries, or by making credit available to the EFSF or whatever structure emerges. Once again, as an aside, under this scenario, you can expect the value of the euro to fall relative to other currencies. Of course, if the U.S. Fed embarks on QE3, the euro’s relative value to the dollar may well hold. Of course, once the crisis atmosphere passes and things settle down, under this most likely scenario, the peripheral countries may not feel the pressure to continue with their promised austerity. Don’t forget, politics plays a large role and austerity often leads to political defeat for those politicians who negotiated it. Already we have seen political changes in Greece, Italy and Spain as a result of this crisis. So, as we enter 2012, the stage is set for some calming over Europe’s sovereign debt and the solvency of Europe’s banks. Mind you, it may be a rocky road over the near term to get there including setbacks and lots of uncertainty and market volatility. The biggest issues will likely revolve around the magnitude of the guarantees and the capacity of the guaranteeing entities. Nevertheless, the most likely scenario is coming into clearer focus. Unfortunately, this scenario, or any other one that emerges, means recession in Europe, most likely severe recession. This has implications for markets worldwide, as Europe’s economy matches or exceeds the size of the U.S., depending on which countries you include. Once again, the recession, coupled with the austerity measures, may change the political backdrop such that the populations of some of the peripheral countries may well want to exit the EMU. While 2012 may bring calmer conditions, even if the most likely scenario is executed, the future of the euro and the EMU is still not assured. It rests on the effectiveness of the fiscal controls. If EMU members retain sovereignty over their fiscal policies, then there has to be some mechanism to expel fiscal offenders from the EMU in an orderly manner. Without this, we may well see a replay of this crisis within the decade. Let’s hope there is enough political courage to include such measures. NEW YORK (TheStreet) — Over the past 18 months, we have witnessed the emergence of what has become known as the “European Debt Crisis.” Capital markets have become increasingly concerned over the sovereign debt of the European peripheral countries and the solvency of the financial institutions that hold much of that debt. You can tell from the 10-year borrowing rates shown in the table below exactly where the concerns reside. Solvency issues manifest themselves in liquidity issues. Looking at the table, you can see that investors are hesitant to lend to the lower tier without significant compensation for the credit risk they know they are taking. The solvency issue also plays havoc with the ability of the banks to access the short-term capital markets for their everyday liquidity needs. And, in some cases, especially among the banks in the lower tier countries in the table, those liquidity strains are huge. If you were a Greek citizen, for example, wouldn’t you go to your bank and withdraw all of the euros you could and put them in your mattress? That is, in order to protect yourself from the prospect of waking up one morning to find that your account was no longer denominated in euro, but in “new drachma” converted on a 1:1 basis, and the free market value of that “new drachma” was such that it took 4 to purchase 1 euro? So, the silent run currently occurring on Greek banks is not surprising. A similar phenomenon is beginning to happen to the continent’s banks. This is showing itself in the form of an unwillingness of financial institutions to lend to each other and a severe tightening of the private sector money markets. So, the coordinated move of the central banks announced today is a reaction to the near shut down of the money markets and it makes liquidity available to the continent’s banks. But, this is not the end of the story because this move only addresses the symptoms (the resulting liquidity issues), not the cause (the solvency issues). As we know in America, the Savings and Loan Industry in the 80s was able to access the money markets in $100,000 increments due to FDIC insurance. As a result, the solvency issues weren’t addressed early when they were relatively small. But, eventually, they had to be dealt with. 2) it allows the solvency problem to continue to fester, and perhaps, become even worse. The sovereign nations have two choices: inflation or austerity. They would choose the former except for Germany’s resistance. That story is still being played out. For the banks, significant recapitalizations must occur. We are likely to see a lot more drama played out on this issue, especially if one of the larger institutions has a misstep or is attacked by the marketplace as we saw in the U.S. in 2009.